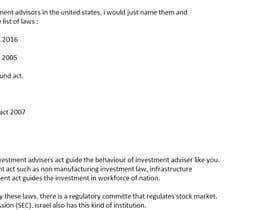 US Lawyer to write law opinion about consulting for trading stocks. 1. Can I (with respect to above description) consult for trading stocks/securities, to US finance & investing legal advisor . 2. If the answer for 1 is no, would it be possible to consult only for watch list (list of stock that trader keep and might buy if they start to rise. 3. If the answer for one is no, would it be possible if I hire (as freelance on regular basis or ad worker) a US citizen that is allowed to consult. 4. Which foreign allowed i to consult to US finance & investing legal advisor . 5 .If the answer for one is no, would it be possible if I hire (as freelance on regular basis or ad worker) a Isaeli citizen that is allowed to consult. 6. I ask for the law reference, so I can read it as well by myself. We do not provide personal investment or financial advice to individuals or companies, or act as personal financial, legal, or institutional investment advisors, or individually advocate the purchase or sale of any security or investment or the use of any particular financial strategy. All investing, stock forecasts and investment strategies include the risk of loss for some or even all of your capital. Before pursuing any financial strategies discussed on this website, you should always consult with a licensed financial advisor.